We're fans of AMD's A-series APUs, as they open up extra options to those looking to build a budget gaming system or capable media PC. However, we're uncertain about how APUs will appeal to people who want to build a performance PC. This is because A-series APUs are a budget option and, while they sport capable CPU and GPU portions, these pale in comparison with the combination of a faster Intel Core processor such as the Intel Core i5-2500K and dedicated GPU. Of course, the latter is more expensive, but PC enthusiasts are usually willing to pay for the extra performance. 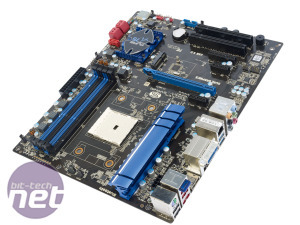 This should mean that, as a budget offering, there isn't much of a market for premium FM1 motherboards; if you're splashing out your hard-earned cash, LGA1155 is the way to go. 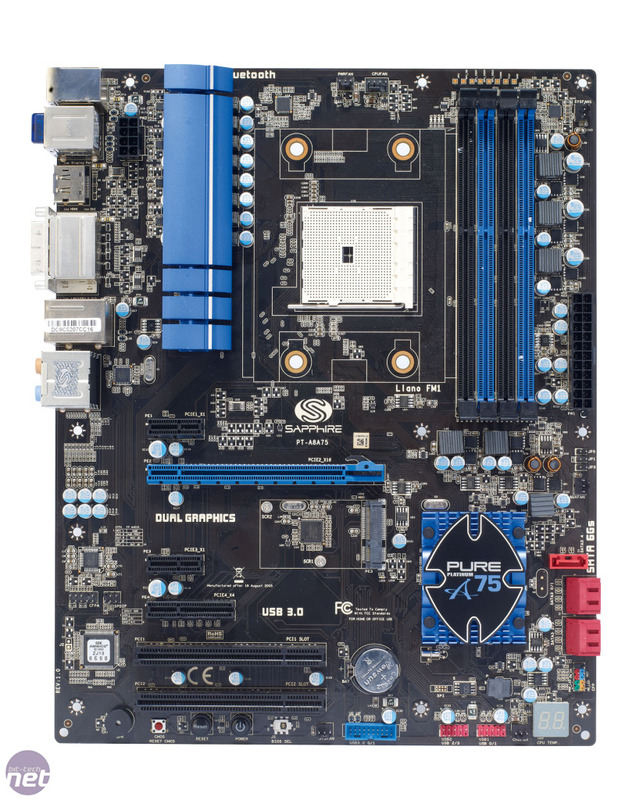 Sapphire clearly disagrees, however, as its new Sapphire Pure Platinum A75 motherboard sports an APU-friendly FM1 socket, along with a number of premium, enthusiast-grade features and a price to match. Many of the Pure Platinum A75's interesting features are dotted along the bottom edge of the board, which plays host to on-board power and reset switches, a slider for switching between the primary and backup EFI, a CMOS reset switch and an on-board POST code readout. On paper, these are all useful features, but we're dubious about how much use they'll be to an average FM1 system builder. 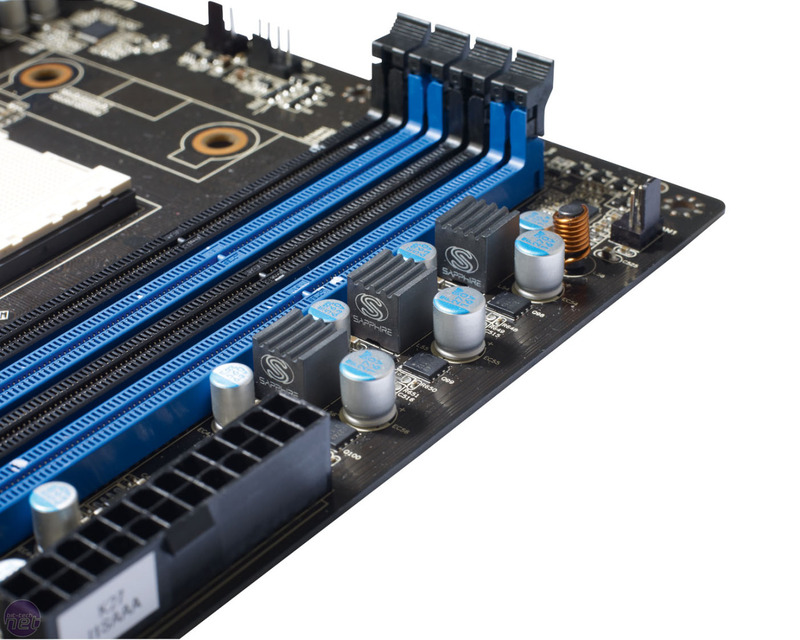 Of greater relevance is the mini PCI-E slot located in the centre of the board. This is an unusual inclusion but could be valuable on FM1 systems, as these are well suited to media PCs or small system builds. As a result, having a mini PCI-E slot could be potentially useful for fitting a small, low-profile wireless card or even a mini PCI-E SD card adaptor; if fitted with a high-capacity card, this could allow for a small Windows or Linux installation. 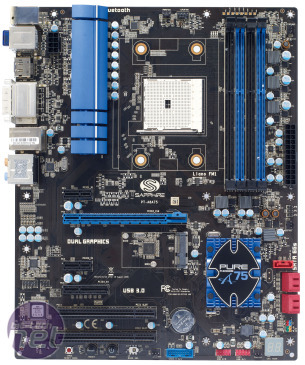 It's an interesting inclusion, which is unfortunately undermined slightly by the full ATX size of the board. Meanwhile, the upper edge of the board is dominated by a large blue heatsink that sits on top of some promisingly advanced-looking VRM circuitry. Also located here are a number of contact points for a multi-meter so that FM1 overclocking enthusiasts can make sure the board is delivering the exact voltages set in the EFI. 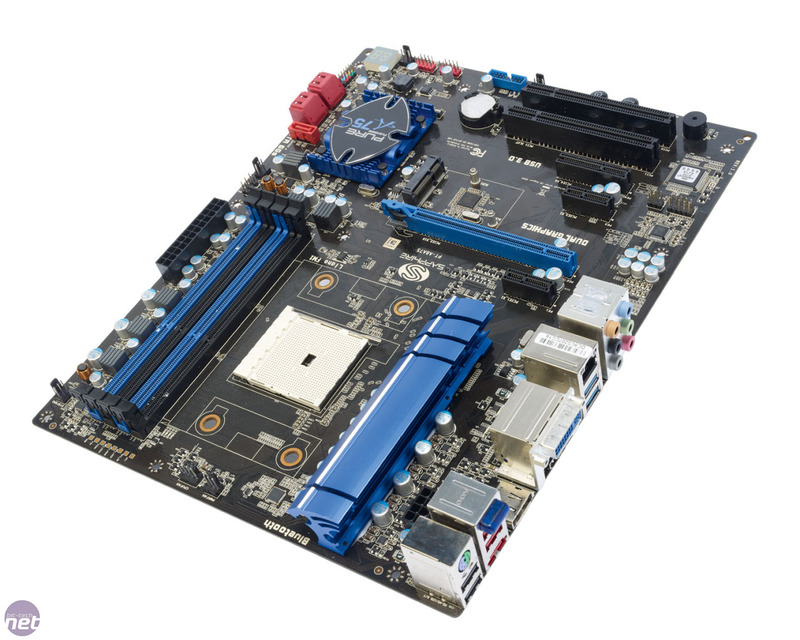 The rest of the Pure Platinum is surprisingly basic, with large areas of relatively unused PCB surrounding the expansion slots and the CPU socket. 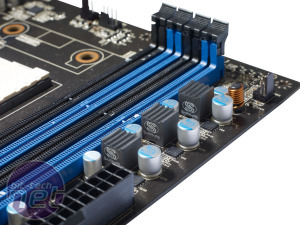 This makes the board feel a little weedy, but it also means that there's plenty of scope for Sapphire to make a micro-ATX version of the Pure Platinum.